Bombings are becoming not so rare an incident in today's society. If you decide to write a novel surrounding a mass casualty incident related to a bombing-- consider using this injury: Blast Lung. Blast Lung is the most common fatal injury related to bombings. It's reported to be more common in patients with skull fracture, >10% burns and impaled trauma to the head/chest. Bruise to the lung (Pulmonary Contusion). Blood or air in the chest cavity (Hemo/Pneumothorax). Traumatic Emphysema (tight lungs with poor oxygen exchange). It's caused by the blast wave pummeling the lung (and other air-filled organs.) If the patient is in a confined space when the bomb explodes they have a much higher degree of mortality/morbidity because the blast wave can pass through them several times as it bounces off walls. The more times the blast wave passes through a patient, the more likely they are to die. 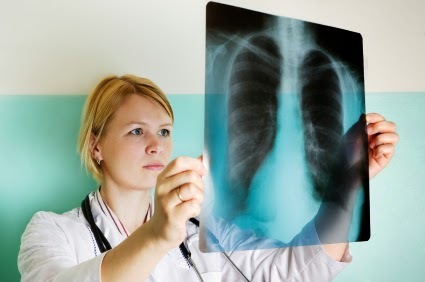 Blast lung should be suspected if the patient presents with difficulty breathing, shortness of breath, cough, coughing up blood, chest pain and low oxygen levels. On chest x-ray a distinctive butterfly pattern can be seen. Treatment is supportive in nature. Oxygen, giving fluid to prevent shock but not too much as to overload the lungs, and a ventilator if the patient is in impending respiratory distress/failure.